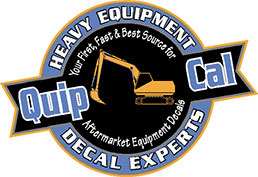 Quip-Cal..."The Heavy Equipment Decal Experts"
Your FAST and RELIABLE SOURCE for Equipment Decals and Decal Sets! Prompt, Knowledgeable, Reliable Service... Thousands of decal sets in digital inventory, covering over 60 years of machinery. If we don't yet have it...We'll make it!! Decals that fit, delivered to your door when and where you say. You probably just want to buy some decals and move on with your day. You don't need to know our history or too many details about our people or even our values. But there are still a few things you'll want to know about us and also a few things we'd like you to know. No one likes dealing with the unknown! We want you to feel at ease when working with us. Additionally, we want to assure you that the time you'll invest in creating a business relationship with our company is worth the effort. Our Business is Built on Person to Person Service. Here's the first thing you should know. We like to give personal service. That is, we want to receive an email or a call and then respond directly so that you're sure you're getting what you need and we're sure that we're sending you the correct decals for your machine. It may make things just a little more complicated to deal with a real human, but we think it's worth it. We hope you'll appreciate that as well. Real People Work Here, and You'll Get to Know us. You'll actually get to know one or more people here. You'll be able to ask for us by name if you'd like and if we're available. We'll get to know your company, your typical expectations, your shipping preferences etc. Generally people are more comfortable dealing with people they know and like. That's probably true for you. We are really committed to bringing you great value. Making decals is not a get rich quick business. This means we intend to be around for a while. Frankly, we can only make money when we gain and keep customers for the long-haul. Your satisfaction and the referrals you provide are a foundation on which we grow and improve. Yes, there may be times when an order is held up or isn't delivered as you'd expected. There are occasions you might be temporarily disappointed with us. That's true for every B2B relationship. What we want you to know is that we may not always get it right, BUT we'll certainly always make it right. You'll want to keep coming back to us every time you need decals because you'll come to trust in us to deliver. We love what we do, and it will show! It's about more than the money. The people who work here enjoy this business, the industry, and the people we serve. Actually - we love creating and producing decals packages for the industries we serve. We love equipment, just like you probably do. The part of our history that matters to you. We got our start in the decal business as equipment sandblasters and painters. It's not what we do today, but it is the roots we come from. This means that our people know what it means to meet delivery deadlines for equipment that must leave for an auction or be at the port tomorrow or on a job-site by Friday. We've purchased decals from others in the past, so we understand what the painter wants to see - and also what he doesn't want to see - when he opens the box full of decals that's just been delivered - that box full of decals which is the last link in the chain of completing the job and getting paid. We do a lot more than sit in an office. Our people are out at auction sites. We meet with equipment managers around the country. We talk with dealership parts managers while standing with them in their parts rooms. We've had plenty of conversations with independent equipment company owners and spent lots of time in rental company shops and independent painters' facilities getting to know them and their frustrations. And... we've walked more miles through equipment yards and job-sites than we can count. All that while, we've been watching, listening and continuing to learn - learn what's changing, learn what customers expect and even learning where we haven't quite measured up. You should also know that all the walking and meeting and listening goes on day, month to month and is part of our model for doing business. It's not just part of our past. It's part of our present and it will be part of our future. We are in touch with real people and real machines and real problems that folks like you encounter on a daily basis. None of that exposure is wasted and all those miles are invested in creating a better or more responsive service and product. But there's still more work to be done, and we're at it. No one likes to hear about problems but it's good for us. That's certainly true for us. But your comments and even your criticisms all go into making our delivery process better. So while we certainly won't be thrilled to hear that you were disappointed, we need to hear that and want to hear that in order to make improvement. Because...as we've already said, we love the industry, we love the work, and we're committed to being in the equipment decal business for years to come. Phone: 215-536-5339 10:00 am to 6:00 pm E.S.T.